Very easy to use. No need for printers as much as I used to need them for simple document signing. One of the must have app on my phone! I loved using this app for the free trial and would have been happy to pay for credits or pay on a per signature basis. However, they use an expensive subscription model which doesn’t fit for someone like me who uses the app only occasionally. I would have considered a subscription if there was a low use version, but the only options I saw seemed to be geared toward the more frequent users. Time to go back to the App Store and try the next digital signature app. Love the software, the service fee is a bit high. This is a great product and very useful when you need it. But if your not remotely signing documents and forms it would be impossible to justify the $12/mo or $100+/yr. Awesome, practical and handy. Love it!! I am within the trial period and unable to send the email to delete the account. support@getsigneasy is an invalid email address. Now too expensive for my needs. I got this because the plan indicated I could buy as needed. While the new plan may work for users with a lot of signing, the single plan available is just too expensive for the small number of docs I process. (just a few per year). It appears this company has chosen to ignore personal consumers and is after the corporate users. I guess I would encourage all prospective clients to try it, use your samples and then move on. That’s what will do. To bad really, I like the app and you would assume the company would want all the business. Ironically, most companies don’t realize, the customers they walk away from fund the competition to develop and compete. Poor choice on their part as there is no real cost to keep low volume users like me. The app is Very easy to use! but for the average person who has 1 document to sign every few months its not worth paying a monthly fee! I totally get the monthly fee in a business setting but this app is definitely not for the average person who has only 1 document to sign and send back! I have used this app for years and it has been perfect for me working on the road all of the time. I’ve tried all of them- Docusign, Adobe, etc and this is by far the best one. Simplest design and easy to use. No hassle- love the minimalism. I signed and sent the doc literally in under 60 seconds! I never leave reviews but this app deserves It, did exactly what I needed it to do. Has some glitches now and then but worked fairly well on my Android phone. I’m just not a happy camper now that I’ve switched to an IPhone! It’s always in a glitch, looses all my info and I constantly have to start over. It spreads the text out over several lines no matter how small the font and you can’t adjust it! You can’t see word predictions like with a Droid so everything has to be entered brand new. Uhhh! It still makes life easier doing billing on the road. This app is great and user friendly. I am more than happy with the service provided and how easy it is to use. I recommend this to anyone looking for a signature app ! I love this application. I can send documents from my phone without worrying about the back and forth of scanning and faxing. This has made sending documents to my new employer seamless. Wonderful! Works good for me .I have been using this app for 8 years. This company fraudulently charged my credit card $39.99 without my authorization. I have called and reported this to my bank and also reported them to the Better Business Bureau. After ten attempts this app is deleted junk. And they have the nerve to charge for something so insecure as to be unmanageable. Garbage. Adobe never fails! I’m sad to say that I loved this app but I hate it now and it’s not because I need to pay for it. The font is all messed up. You must do what word at a time. It’s all distorted no matter how you change it. I canceled my subscription after 5 years! Why did you need to ruin such a great app? I do t have time to type each word and have be all distorted. Maybe you wouldn’t care, but you lost a 5-year dedicated user. THIS APP IS RUINED. IM QUITE SAD AND FRUSTRATED. ISE SOMETHING ELSE. Pay as you go gone? Obviously I’m not a real power user - have to use this occasionally for random life documents. Guess they took away the ability to pay-as-you-go and now require a monthly subscription (using a dark UI pattern that pushes you on a one-time annual fee while presenting the monthly breakdown). Careful! Pay $12 to do one e-signature? No, thanks. I thought you got three free signatures? BS. It tried to force me to pay $120 annual. Why would they attempt such a brazen lie? Bad joke. Unprofessional! Docusign instead? This is the bomb!! I use it for all documents I have to sign and it takes 3 minutes and saves printing paper and killing trees. I love the app, very unhappy that you want to a monthly fee, when I may only need it a couple of times a year. Great customer service. Excellent product. Wouldn't want to be without it ! Saves me on time sensitive material. I love this app and definitely not get rid of it. When I ran out of credits and had to send my direct deposit to my new employer, the app Team gave me a free credit just to get the emergency handle. I truly appreciate this company and this app and is will be on of my #1 business tool. Got super greedy in their fees. They lost my business. $120 a year. When I use it 10-12 times a year. The easiest app to use! Very simple and very effective! Excellent app, gave 5 stars but it is crashing from time to time and I need to start over with filling the information, and it’s frustrating when you have many pages to do in short period of time. Sign docs while out of office on my iPhone. Sad the pricing changed. I used to pay per bundle of signatures. Now it’s yearly/ monthly. I have loved this app but I don’t use it often to pay monthly or yearly even. I’m afraid I’ll have to look elsewhere and am so bummed. This was the best. Was a very happy user of this app for years. Would buy 10 sigs at a time and use them as needed. Now they’ve gone to a monthly subscription model so at a minimum you’re paying $120 a year. Unfortunately I did not use it quite enough to justify that so they priced me out of use. Don’t waste your time on this app if you only need to use it occasionally. Just very simple and easy to use..
Once they did away with the purchase signatures as you go and only limited you to a monthly plan. I am now deleting the app and using another platform. App works fine, easy enough to use, but I downloaded this app just as a utility tool, but had no idea that once my “trial documents” were expended that I’d be expected to pay for the ability to sign documents. Especially not worth $10.99 to do so. I’ll take the extra few minutes to print a doc, sign it, then use a free scanner app to disperse it as needed. This app helped me out so much! I was on the road and I had applied to rent a home and needed certain documents submitted today! I was no where near a computer or fax machine but this app just made it so much easier!! I was able to upload the documents to the app and digitally sign them! Saved me time, money, and the hassle! So thank you to whoever made this app available for free! Kelly in support was AMAZING!! Let me say first that I have never submitted a review of any app. This is the first but with a bonus! The App and the support service is incredible! I had a major issue with a disconnected account from years ago that affected my subscription. Kelly walked me through a solution that was not simple. She showed the patience and attention all customers wish to experience with any service oriented business. Both Kelly in support and the APP get A+ rating. I’ve used this app to sign forms on one home loan and two refinances. I’ve also used it when signing documents for my insurance policies including life, Property and auto. As a commuter, this app has been a life saver! I’ve even used it for those not so important documents just to add a professional touch. If you spend your life on the road like me and still need to get business done, this app is a must have. Many users want the old plans where you can pay as you go. I updated my review because the company changed their payment methods. They became greedy and now want to charge yearly/monthly rates instead of pay as you go. The app is very easy to use. My only reservation is the cost. It is easy to use on iphone and IPad. Love the mobility & Ease of signing-so do my clients! Don’t waste your time use sign easy !!! 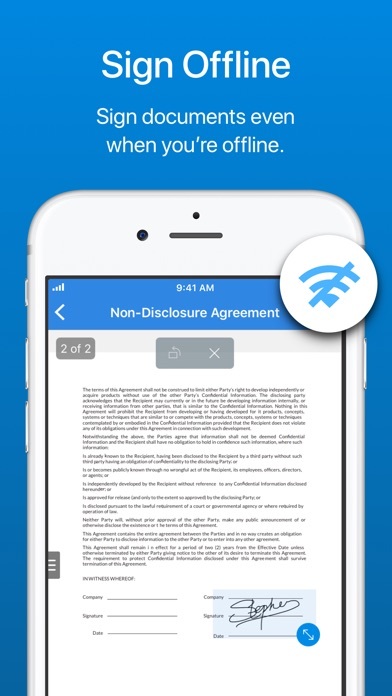 This app makes it so easy to sign anything from any other place on the planet at any time. Really useful. Works very easily. I use it all the time. I sign all of my documents for Sign Easy. I travel and haven’t had a computer or printer for three years thanks to sign easy!!! It would be great if there was a way to document the time of day as well as the date in a quick manor. I have downloaded tons of signature apps through the years and have now stuck with this one. This is absolutely the easiest and best quality signature app you can get. I even switched to the Surface pro for a while and ended up going back to my IPad because there wasn't anything better out there on any platform. Use free Adobe fill and sign instead. I am not spending $119 for just minimal use... More options are needed for users who may need to sign less often. Same thing I read in another post. I’ve loved the app for years and only sign a handful of documents a year. I’d be happy to buy credits but the $119 a year just isn’t happening. Thanks and best of luck. You kidding? I am not going to spend 100 bucks a month to sign electronically. I’d rather print it out, screen shot or download another app. At least offer credits. Worst move. On to your competition! The app works great & I purchase the annual every. However, I have suggested for the email to not be auto populated with their content. It’s very annoying to have to go in to the email every time and delete their advertisement in my professional email that I’m sending to a client. I don’t feel I should have to advertise for the app especially when I pay for it every year. Also, there needs to be a one time fee as opposed to an annual fee. I sign 1 or 2 documents a year and this app is too da*n expensive at $120 a year?! Get a grip and come up with cheaper options! Hidden prices and renewed subscriptions. Very difficult to cancel. Contacted the owner multiple times no response or reply. No refund as of yet. Very disappointed! I sign probably 5-6 documents a year. The 10 signatures for $4.99 worked great for me. That option is no longer available. I understand that developers have costs, too. Unfortunately I don’t need to sign things enough to warrant the $120 yearly subscription, which is the cheapest option available now. I’ll be happy to use this app again if something like the 10 for $5 becomes available in the future. Until then, it was easy and a very good app; but it is too expensive for occasional users. The ease of use is terrific. It has been a mammoth time saver, even saving deals. This is a simple and very necessary app. I love it! I’ve used SignEasy for years, and it’s been wonderful. But it hasn’t been sending out my contracts for at least a month, and I’m losing work because I THOUGHT signed contracts had been reaching my customers. THEY thought I didn’t want the job. I’m going to have to find another app, and I’ll lose all of my saved, signed and unsigned contracts BECAUSE I CAN’T GET THEM OUT OF THIS STUPID APP! Oh - and customer service doesn’t return messages via their chat line or email. Would love to give it 0 stars. 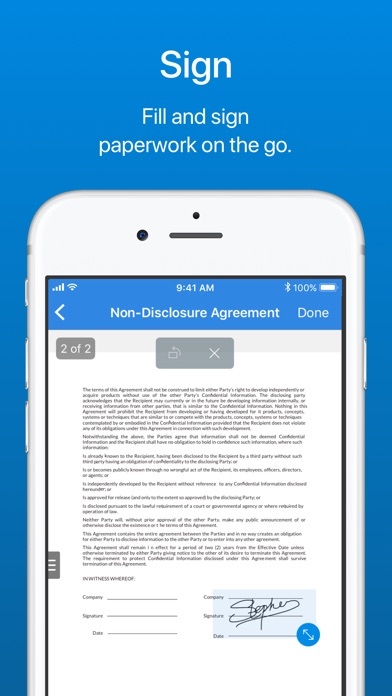 This app is easy to use for business documents and signatures. This is my first time using this app and it saved me time and money. I will definitely share this app with every business owner I know. I downloaded this app to try. Should have 3 sends free. However these are only if you sign doc on your own device. You can't remote send. If you want that feature (why else would you get this app?) you have to upgrade to plus membership and pay $180 annual subscription which is NON REFUNDABLE. I deleted the app. Your app description says that we can get 10 credits for 4.99. Yearly option is not for everyone if you use this occasionally. This app was great until it stopped opening. You tap it and it closes automatically, no updates available. Could be my way phone but it doesn’t work and I am paying a subscription fee. I’ve used SignEasy for years, and it’s been wonderful. But it hasn’t been sending out my contracts for at least a month, and I’m losing work because I THOUGHT signed contracts had been reaching my customers. THEY thought I didn’t want the job. I’m going to have to find another app, and I’ll lose all of my saved, signed and unsigned contracts BECAUSE I CAN’T GET THEM OUT OF THIS STUPID APP! Oh - and customer service doesn’t return messages via their chat line or email. Would love to give it 0 stars. 12-14-18: Wrote support, as the developer asked. No answer. Guess I’ll have to move everything to a different signing app. I’ll never understand why developers feel the need to change an app that has worked beautifully for years. Why in the world would you create an internal email system - especially one that doesn’t send anything out? I tried going to Other, so I could email through my own email account. It crashes. So I’m still paying to sign contracts that are undeliverable unless I send them to Dropbox, then to another app, then to my customers. Very very disappointed. This app is awesome and so user friendly. I completed signing a word doc in my email in less than two minutes from the start of the download to completion. Great job everyone on board! I like this app when it works. However, it seems whenever I must sign a document, it fails. Today, when I tried to open a document, it said I must sign into SignEasy first. But it doesn’t give me any opportunity to sign in. I forgot to sign something then had it sent to me and I signed it right on my phone. Amazing! Saves me so much time from printing and signing.... I have to sign a lot of contracts & its just time effective for me. Used to be good. Not anymore. I used to use this app all of the time. I was a very loyal user. Now it crashes constantly on the iPhone 7 Plus and iPhone 8 Plus. The price has gone way up and the app is almost useless. I cannot finish a single document anymore. I will be requesting a refund on my subscription. Sent items no longer show up in your sent items. Big slide in the value of this app as a result. I use SignEasy almost every day. It is a super time saver. And if you’re trying to cut down on paper in your office, SignEasy is the answer. Also, everyone I work with is super impressed with being able to sign work-product in their own hand and feel confident that it will not be regarded as invalid. Great app - awesome and easy! Great app for on the go invoices and documents. Surprise, you’ll be charged $120-$180 upfront to upgrade for simple features. Forget $4.99-$9.99/month or something. What a waste of time. Saves me so much time printing and signing.... I have to sign a lot of contract.... very simple. It crashes nonstop and I can't complete a single item with it. Entirely worthless and they make you pay a year up front for $119. The easiest app i have ever used! I use to like this app when you can use it occasionally. Now you have to pay $10 a month, not worth it when you only need it a few times a year. I use it with respect to housing homeless veterans and we do not have the resources to pay this kind of fee on a monthly basis. I love this app!!!! It's made my life so much easier. Signing docs made quick and easy to use! It’s unfortunate that this company has decided to exclude those individuals that use their service on a limited biases. You now need to pay a minimum of $10 per month for this service, which is crazy if you only need to sign a 1 or 2 documents. That’s like signing up for an unlimited cell plan and making a couple calls a month. I will be using another sign app as a result. Just my opinion. I used to love this app but now it’s been updated and nothing works! It says it’s emailing my documents and that they are sent but no one is receiving them. I’ve even tried to email to my various emails and they don’t show up. I used to be able to select which email I would send from and that option is gone. Not that it matters because the emails don’t send. So awesome and easy. I wish I would have thought of this App. The email format is horrible . I’m not able to send emails with a message and the signed attachments as before . I mean seriously, it's way more expensive than it should be. It's disappointing there's no longer a pay-as-you-need option. $9.99 per month is the cost of Photoshop and Lightroom! For something I'll use to sign 4-5 documents per month $9.99 is way too steep. Maybe $2.99 or $3.99 per month would be more reasonable... or for $120 it should be unlimited/forever, not just for a year. It seems a great program it's just insanely over priced. THE APP WAS A VERY GOOD APP. HOWEVER, SINCE THE UPDATE IVE HAD NOTHING BUT PROBLEMS. AND SUPPORT DOESN'T HELP. THEY JUST TELL YOU TO DELETE AND REACQUIRE. THIS DOES NOTHING. AND WHEN YOU'RE PAYING FOR AN APP, YOU EXPECT MORE. The new version takes a little getting acquainted with. Recent Changes are not an improvement. Price is not as good as previous version. I really appreciate the convenience. A+++ great app, always works, never crashes and always there in a pinch when I need to sign something on the fly! Good job guys. I’ve used Easy sign on my iPhone and it is great. This version for iPad, not so much. I did not have the option for the free trial, and the ability to sign is too costly. Agree with previous reviewers that cost model does not fit and needs review. I do appreciate document trail ability but not enough to pay current fee structure. For the past several months the app has gotten slower and slower. I hoped the new update would fix it but NOW it takes about 10 minutes to fill out a document that used to take less than a minute. No other slow problems with my tablet. I USED TO LOVE THIS APP BUT NOW IT INFURIATES ME WHEN I USE IT. Have been using this for my business since 2014! Till today I still use it to sign forms and such! Totally free. Couldn’t rely on any other app! This is as great as it gets! This app has saved me SO many times and SO much time! I am a freelance photographer on the go and traveling constantly, so having an app where I can sign important documents like W-9’s and contracts for my clients on the spot (ex. While boarding a plane) has been so helpful! use and recommend often! love it! I used for 1st time few years ago. And no matter the occasion... I access immediately and complete the requisites in a easy way! Has made my life so much easier when I am on the road and need to sign and return important documents! Easy to use and has been very convenient for me. Definitely recommend it. I am a person that is constantly on the GO! 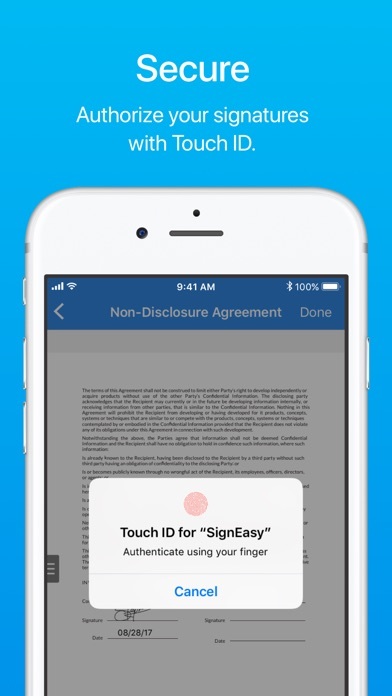 And this app saves me so much time by making it so convenient to add signatures to documents on the go! I have been able to keep things running efficiently at work by always replying immediately to urgent items that need my signature. No need to have printer/scanner/PDF software to do this. Just love it and highly recommend it!!! 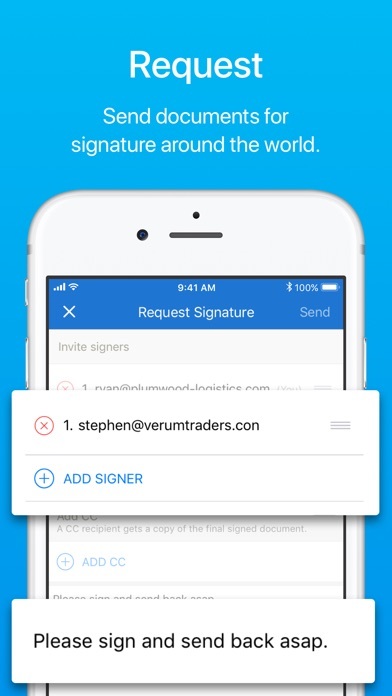 Easiest and fastest way to sign & send any document! So easy! Love this app! Great for those last-day permission slips the kids hand you right before work! Important app, convenient. But, it’s not just a one time fee to get all features. You can’t sign anything without buying credits. You need to pay monthly etc it’s too much for a basic feature. 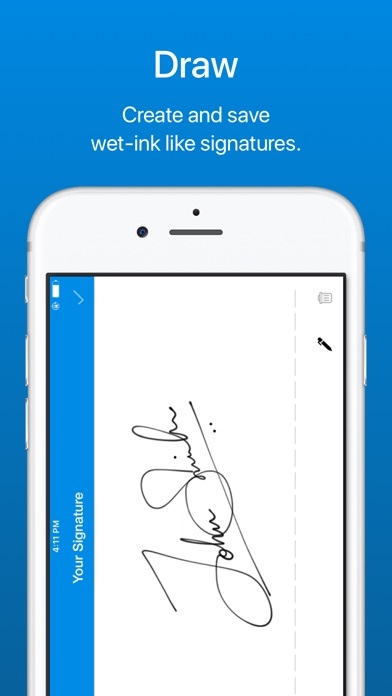 I use this app for every digital signature in business. It’s perfect!